It is officially Autumn now – so says the calendar, but where we live that means basically, nothing. Yep nothing. Except the likelihood of a hurricane. No really, hurricanes are most likely to hit in our area in September or October. Thankfully since 2005, we’ve been very fortunate. All that said, it is still hotter than blazes here and what is worse we have had no rain to cool off the afternoons. So I am trying to force the issue with apple cake. Force the fall to get here sooner by sheer force of will. Apples and cinnamon – I think that equals fall, at least it does for me. Preheat oven to 350 degrees. Spray a 9 x 13 inch baking pan with cooking spray. Over a piece of waxed paper, sift together flour, baking soda, cinnamon, and salt. Set aside. This is a thing I do with dry ingredients. It is kind of habit. In a large bowl, mix together sugar, eggs, applesauce, canola oil, and vanilla. Stir in flour mixture. Fold in apples. Pour into prepared pan. Bake 30 – 40 minutes, roatating the pan half the way through, until a toothpick comes out clean. For Frosting: In a stand mixer, beat together cream cheese, butter, salt and vanilla until smooth. Sift in confectioner’s sugar, but add more confectioner’s sugar as needed. Spread over completely cooled cake. * I did not make the frosting because I wanted to try the cake on its own first. We decided that it was really good with no frosting. Maybe next time I will bake the cake, cool, and turn it out and cut in half and frost half and leave the other plain. I made this cake on a whim (from Bon Appetit – March 2006) the first time. I mean – longest recipe name, um, ever. But all the component parts sounded really good together. The methodology was different than anything I had ever made and that made it all the more appealing. Then the Boy went crazy for it – understandable. It was/is slightly amazing. And it has stood the test of time. Let us see how that works – it works like this: 19 March 2006, 22 April 2006, 22 April 2007, 26 April 2008, 24 April 2010, 19 April 2013. 26 November 2015 – all of these at the Boys request. Are we seeing an April – birthday – theme. Yes, yes we are. But it totally makes sense for Thanksgiving – fall & apples. 2/3 cup superfine sugar or regular sugar – does not seem to make a difference, and I have done both. Preheat oven to 375°F. Sift flour, baking powder, and salt over a piece of waxed paper. Using mixer, beat butter in large bowl until smooth. Gradually add sugar and beat until well blended. Add eggs, one at a time, and vanilla; beat until blended. Mix in flour mixture, then sour cream. Stir in chopped apple. Set aside while preparing the upside down part of apples and butterscotch. Melt butter in 10-inch-diameter nonstick ovenproof skillet* over medium heat. Add apples and sauté to soften just a bit. Then add brown sugar and butterscotch morsels; stir until melted and smooth and mixture is bubbling. Cook until apples are golden, u (there will be a lot of liquid in skillet). Remove skillet from heat and let cool 3 minutes. Using tongs, arrange apple slices in skillet in concentric circles or other pattern – if you are really that person – never bothered myself. Carefully spoon cake batter in dollops on the apples in skillet. Using offset spatula, spread batter evenly to edges of skillet (batter will seem to float on top of apples and pan juices). Bake until cake is golden brown and toothpick inserted into center comes out clean, about 30 minutes. Cool in skillet 10 minutes. Run plastic knife around edges of cake to loosen. Place large platter over the skillet. Using oven mitts or pot holders, hold platter and skillet firmly together and invert. Use the courage of your convictions. Serve cake warm. Or at room temperature – it works just as well that way. *If your nonstick skillet does not have an ovenproof handle, wrapping the handle in two layers of heavy-duty foil. I always do this and it works – and my skillet is only 9.5″ but I kept it just for this recipe. Would not want to disappoint the Boy. When I was a kid it was a huge thing for us me in the summer when my mom made limeade. I don’t do that enough and need to remedy that. Limeade went along, typically, with boiled peanuts and watermelons on a summer Saturday. I love the nuanced flavor of a lime. I also think that the best way to eat an avocado is with lime and some sea salt – just heaven, but not on toast. Too trendy, and, to my mind, a bit insipid. Lime also features in my mushroom and watercress pate, because it is citrus but just a bit sweet too. Lime is a lovely complex flavor. I am always making lemon cookies, I know, you are all astonished, right? but lime, not so much. I think it is because when you see something lime, it is typically pie. Which I have nothing against, but you don’t see much in the way of lime cookies. So I am making a concerted effort to change that – single handedly. Sift together flour, cornstarch, and salt over a piece of wax paper – I do love to do it this way. It’s simple and easy to clean up – Set aside. Put butter and 1/3 cup of confectioners’ sugar in the bowl of a stand mixer with the whisk. Mix on medium speed until pale and fluffy. Add lime zest, lime juice, and vanilla and mix until combined. And here is where things became interesting … Really should have used the paddle attachment. The whisk was a pain, esp. to get it cleaned out to get everything mixed together. Then, because the whisking didn’t go well, it took some time to hand mix the dough to get it come together. We will no return to our show, already in progress…. Divide dough in half. Roll in parchment to form a log 1 1/4 inches in diameter. Refrigerate logs until cold and firm, at least 1 hour. Preheat oven to 350 degrees. Remove parchment from logs and slice into 1/4 inch thick coins. Space coins about an inch apart on parchment lined baking sheet. Bake until barely golden, 12 minutes or so, turning the pan halfway through. Cool on a wire rack 8 – 10 minutes. 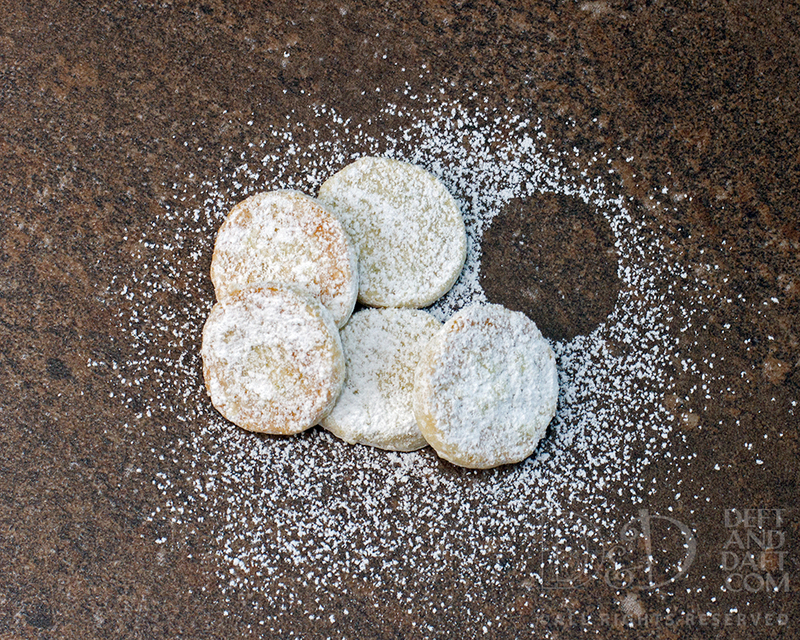 Place the other 2/3 cup of confectioners’ sugar in a zip top bag, and toss the still warm cookies to coat. Store airtight at room temperature for up to two weeks. These were really good, if you like citrus. Went over well with my friends. It’s shortbread after all.